The elegant Drawing Room is found on the Ground floor and with it’s large proportions and beautiful features of original plasterwork and cornicing. This offers a fabulous space to entertain with pre- dinner drinks, or just to relax on stylish sofas to enjoy watching the 49” smart television. The Town House was recently renovated to the highest standard offering luxury, boutique accommodation for 2 – 14 people. 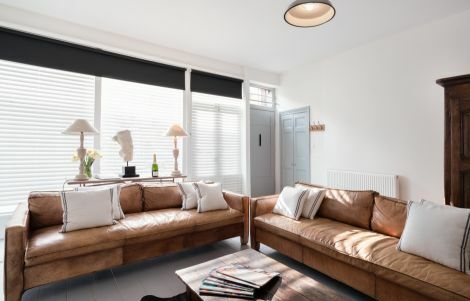 This lovely Georgian House is beautifully decorated with a melange of carefully chosen furniture - a clever mix of antique and contemporary. There are Perfect views both to the front and back. 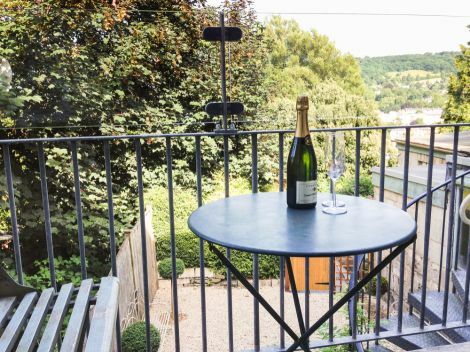 The balcony, a wonderful area to enjoy a quiet drink looking across Bath to the valley beyond. Enjoy this luxury self catering accommodation in the centre of Bath. Plenty of space to relax on the Italian leather sofas or on the balcony with the stunning view of the city and the valley beyond.